Any motivation to get up and move is welcome motivation, am I right? Our lives have become way more sedentary, most of us sitting at computers all day. An extra kick in the pants is something we all need and I just found one you’re going to love. What's more, it'll help you spend less and aid in your efforts towards credit repair. I admit, when I first downloaded this app, I thought it sounded a bit scammy. Before I put in any personal information, I checked it out. In my research, I found out that Carrot Rewards is actually a project developed in partnership with the Public Health Agency of Canada, the governments of British Columbia and Newfoundland & Labrador, the BC Healthy Living Alliance, Diabetes Canada, YMCA and the Heart & Stroke Foundation. With that many big names behind it, I figured it had to be the real deal. So, I tried it out. Basically put, this app rewards you for healthy choices, moving your body and answering health and environment-related questions. We're talking monetary rewards that help you reduce spending and indirectly enable you to work on your credit repair. The best part, though, is that it rewards you with your favourite loyalty points. Right now, Carrot Rewards supports Petro-Points, More Rewards, Aeroplan Miles and Scene points. I’ve only had the app a week and I’ve already earned 3500 Petro-Points - in total requiring about ten minutes of my attention. That’s $3 worth of gas for ten minutes “work”. Oh yes, this will help wonderfully in my efforts to become debt free. When you first download and install the app, it’s going to monitor your daily steps for about two weeks. You can choose to use either your phone or your FitBit to monitor your steps. Once the two weeks is over, you’ll get activity-related challenges that will reward you with more points. You can also earn points by completing “offers” in-app, which usually require you to answer a series of questions about health, energy, and overall well-being. You can literally earn free gas, groceries and travel miles while standing in line at the bank. If you're working towards credit building, credit repair and becoming debt free, this app can certainly be a tool to those ends! Refer your friend for even more points earned! They also get bonus points when they use your “bonus code”. I'm still in the activity monitoring stage of the app, and I’ve easily earned points whenever I have a free minute or two. I am looking forward to the activity-based offers to come! Being as this app is fairly new, I imagine there is much more it will offer in the future. I am hoping to see new points programs connected to it such as Shopper’s Optimum points and PC Plus points. I also hope to see support for more devices than just the FitBit. I, myself, have a Garmin Vivoactiv HR which is much more accurate at recording my steps than my phone is. For now, I am content, though, to earn free gas for minimal effort. There's really no downside to spending less on gas, is there? It'll help you with your credit building as well as with becoming debt free. This is a great app, and totally worth the tiny amount of time it takes to install and set up. 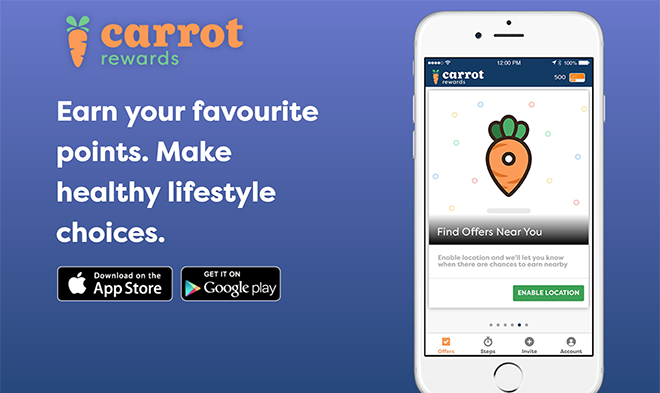 Click here to get started with Carrot Rewards, spend less, build credit and get closer to becoming debt free.